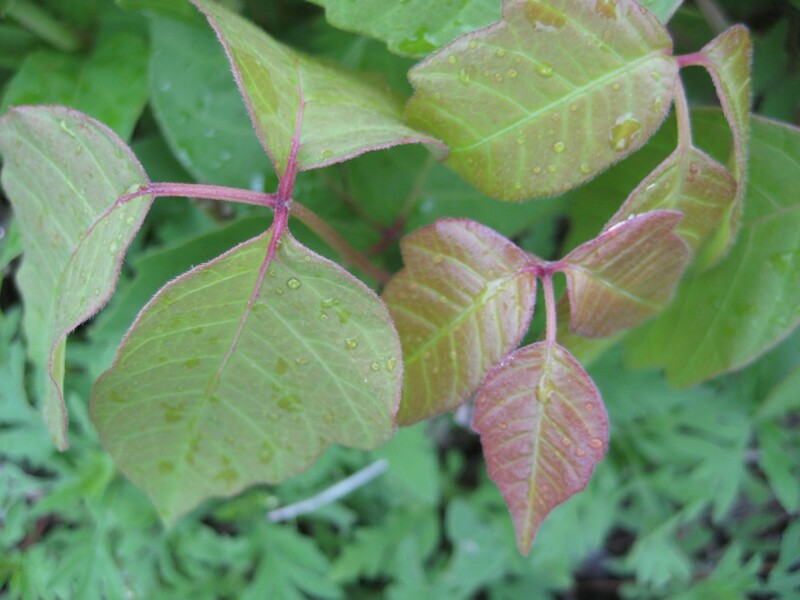 Home » edible » Can You Eat Poison Ivy? A tiny red leaf. It catches the early spring sunlight like a ruby. I hesitate, take a deep breath. Should I eat it? Just a little teeny bite of poison ivy. It’s research, after all. 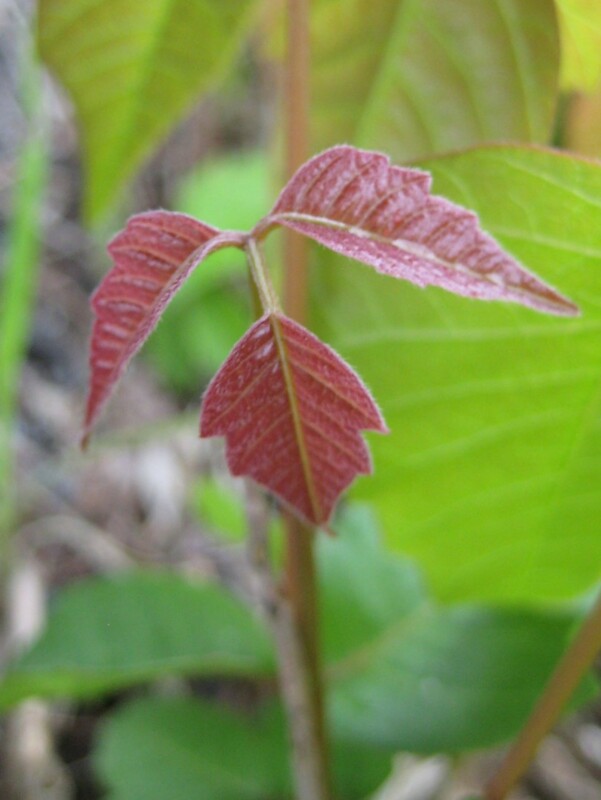 There’s an old, old belief that eating a leaf of poison ivy every day in the spring will make you immune to the itch. It’s undoubtedly true, I read it on the internet! All sorts of websites attribute the custom to Canadian loggers, Spanish conquistadors, or various unspecified Indians. But many reputable sources agree that it’s possible to attain immunity by eating poison ivy. Euell Gibbons, the famous wild foods guru of the sixties, swore by this method—he recommended starting in spring when the leaves are small, and eating one a day, therefore getting a small and slowly increasing dose of urushiol, the toxic chemical that causes the itch, so that your system can gradually develop an immunity. The early spring leaf in my fingers is no bigger than a pea. How could such a small amount hurt anyone? But research has shown that a sensitive individual can get a horrendous reaction from 50 micrograms of urushiol—a grain of salt weighs 60 micrograms. This little leaf contains one of the most potent toxins on earth. Urushiol causes an allergic reaction in approximately 85% of humans, and dermatologists have estimated that one ounce of urushiol would be enough to give a rash to thirty million people. The stuff is plant plutonium. I drop the leaf on the ground. Nope. Just can’t do it. I’m not particularly susceptible to poison ivy, but allergies are tricky things. You can develop them as you age, or grow out of them. This eating poison ivy thing does seem to work for quite a lot of people. But it’s important to remember that, chemically speaking, poison ivy is not a poison with a specific antidote. If ten people drank arsenic, they’d all die. If ten people walk through poison ivy, a few will be fine, most will be mildly itchy, and one will end up in the emergency room. Poison ivy is an allergen, not a poison, and everyone’s immune system responds to it a little differently. Nothing works like magic on poison ivy, not even the modern medical arsenal of steroids and antibiotics. Poison ivy is too unpredictable, too complicated a question for any one answer to be the solution. The plant isn’t all bad. It’s only humans who get this itchy reaction so horridly–many species of wildlife, from mice to moose, eat the leaves with no ill effects. Poison ivy berries are a crucial survival food for birds in winter. Lots of our most beloved songbirds–robins, bluebirds, cardinals, mockingbirds–love PI berries. They feast on poison ivy–but sadly, humans aren’t invited to the banquet. So, no PI salad today, thank you. A nibble of poison ivy just might sensitize me so that my next poison ivy encounter would be worse than ever. I guess I’m just not a truly dedicated researcher. I’ll have to enjoy poison ivy this spring from a safe distance. When I was 14 I spent the year getting reinfected from head to toe in poison oak. This resulted in desensitizing me to it for 50 yrs now. Even now I may get a spot of it in early spring which disappears in three days. After that I can crush and rub the leaves into my skin without a reaction. Take home message would be you can get the same benefit from topical exposure without exposing yourself to the potential for internal complications from eating the stuff. I just accidentally ate about 10 extremely red poison ivy plants, what should I do. My mouth is on FIRE. My boyfriend said it was a salad. A). An OPEN cut or SCAB . B). If I was NOT SWEATING profusely throughout the day. Apparently when one sweats the poison (urushiol) is actually pushed out of the pores contrary to what common sense would seem to tell oneself-that dilated pores would let the poison into the skin more EASILY. Yet, it’s EXACTLY the opposite reaction. One day my ground/rope guy bragged that he could EAT the PI and nothing would happen. He picked up a hand full, chewed it up and swallowed it. I was shocked as time went by and nothing happened to him. I’ve never seen Brian with PI in two years. So, one day I grabbed a few leaves and chewed them up but spit them out. Then I repeated this process every week just for shock value to amuse customers. Within a month I was swallowing the stuff and ENJOYING the taste! I’ve been in contact with hundreds of PI covered trees since and have yet to see a single hint of topical dermatitis! I don’t recommend copying my moronic behavior but I can truly say that eating PI has definitely built up my tolerance to the stuff to 100%. Interesting! Thanks for posting. I’ve often found that “old wives tales” have a strong bedrock of truth to them. I suspect this would work for many people, although it’s not for everyone. Is it possible that the eaters of PI are actually picking Virginia Creeper? What do we do with the statements that say that the Indigenous Americans feared PI? Good point, there are so many PI look-alikes that it’s certainly possible not everyone is talking about the same plant! I think it’s fair to say that most Native Americans would have been able to recognize PI–I don’t know if they feared it, but they were well aware of its dangers. There are certainly dozens of well-documented Indian remedies for the rash. A big contrast to the European settlers who blundered into poison ivy having no idea what it was or what it looked like, or how to heal it. i react pretty bad to it. I’ve been completely covered in raised red blisters from head to toe and my stomach was noticeably swollen on one side of my body. I have so much around the house that i get it all the time in the summer. I decided to start eating it. I ate the smallest amount (still red in the leaf in early spring) in a piece of bread at first and waited a few days. i purposely was careless while working around my property. I noticed i had a small amount on my hand, stomach and forehead. I ate some more and it dried out and cleared up within 4 days. i had no internal reactions or anything. I then ate 3 fully green and mature leaves for a 3rd time consuming, and have not been prompt by any means to wash my hands or legs or clothing. i have not had reactions to it and i held it in my hand with no gloves and no bread. i seem to be ok. i’m not going to say it will be the same for everyone, but i can say what’s happened to me. That’s fascinating, thanks for posting that. Hope it continues to work well! Some years ago, I did the ‘A leaf a day in the month of May’ prescription. Each morning, I would go out to an outcropping of poison ivy and find a young light green leaf. It had a mild sweetness. That Summer, I spent a lot of time in scrub, forest and logged areas. I had no problem with poison ivy. How interesting, thanks for writing. I’m always interested in what the actual experience of eating poison ivy is like. It makes sense that the leaves would taste mild and sweet since so many species of wildlife use them for food. I have noticed that eating it doesn’t necessarily make me immune to it’s effects on the skin, though. For example, the other day, I was weedeating poison ivy at chest level, and the juice was just flying. A day or so later, my arms started itching, although I hadn’t eaten any for a few days. Thanks for sharing your experiences, this is very interesting. I think that the human immune system is so complex, and so unique to each individual, that it’s really difficult to predict how we’ll react to poison ivy each time. A cure that works perfectly for one person might not work at all for another. It tastes pretty good once you get accustomed to it. The taste is acquired — kind of like with turnip greens, but there’s nothing lemony about it. Here’s a plus. I had an appointment to see a dermatologist tomorrow because of what appeared to be a skin cancer. It has disappeared. I called this afternoon and cancelled the appointment. Been considering making some poison ivy pickles or poison ivy pepper sauce. Or maybe I should can some P I for use in the winter. How interesting! Thanks so much for sharing your experiences.